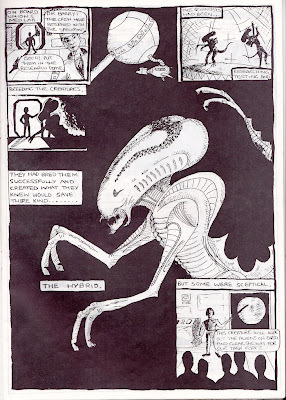 a) In 1993, the Alien Fanclub fanzine Facehugger edited by Simon Clarke, an amature comic book writer /illustrator by the name of J. J. Booker surprised the readers with a short story called "Hy'brid" where a new alien hybrid has been bred by the human race to deal with the known aliens, one mixed with the genes of the Predator. 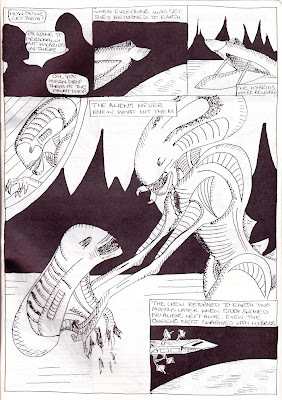 b) In the Aliens vs Predator comicbook, every alien that came out from a host whether it was human or beast would grow into a man sized semi-humanoid creature as seen in Aliens Most people were unaware of the idea that the Alien should take on the characteristics of the host. However the creature in this story also had developed the ability to become invisible like its host had managed to do by technology, which is something that the final Predalien would not be able to do.